Yesterday, I read something inspiring. I’m the type that likes to search for the meaning of life; to find my purpose. We’re all different. We keep telling each other that no one’s the same. I never looked into it, just accepted and ignored this saying. 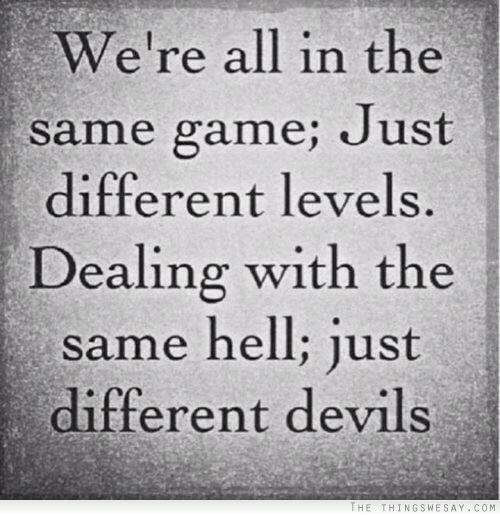 I moved on with my life, hearing “we’re all different” constantly. People keep telling me I’m different. I’m odd; just a bit off-beat in a tune. A Bug in the Air! I’ve been sick since mid-December with mild congestion. All this time, I’ve just been resting, keeping warm, eating soups, taking a higher dose of my vitamins, etc. I was doing everything to keep me from visiting a doctor. I remember sleeping right through the new year because I was heavily medicated – my symptoms worsened a bit. Again, I still thought that I could handle these symptoms. It was around this time when I started reading about the deaths that have been occurring due to the flu. I was scared… I have such a weak immune system. I still kept at it. I developed a strong productive cough, moderate congestion, body aches, and headaches. I remember it happened on a Wednesday, I woke up extremely groggy. Feeling hot with a bad headache. My whole body hurt. I needed to get up to get ready for my fire class. Part of my morning routine was to get my coffee – I need coffee before I do anything to start my day. Not even halfway through my drink, I sat down for a long time, thinking about how “off” I felt. My head felt heavy and I was really struggling with my breathing. I checked my pulse and got a reading of 124 bpm (I was just sitting and I barely had any coffee!) I took an extra strength Tylenol and seriously just waited… waited for it to kick in. I sat for nearly an hour before getting ready. Why of all times didn’t we have a thermometer? I went straight to CVS and bought all kinds of things, called my boyfriend to keep him informed, and checked my temp as soon as I got in my car. I was at 103.7 F! I was extremely troubled. I have a new job – not just any job, it’s for the county. Me, being the anxious wreck that I am, I didn’t want to just not show up to this mandatory class. So, I went, but I swear to you, I slept for most of it. We had a test and left early. Just awful. I was thankful for having a day off the next day. The next 4 days were a struggle, especially at work. Fever went away on Saturday, checked at different times throughout the day. I kept thinking it’s finally over! On the 14th, I noticed I felt a little warm again – checked my temperature and read 99.7. What… is going on? Next day, I woke up with some blockage in my throat. As soon as I got up, I felt this extreme pain when I tried to swallow. For some reason I was salivating excessively so I kept swallowing or spitting. Both ways hurt like hell. I went to Kaiser not long after. I was seen in less than 10 minutes! At the end of this visit, I ended up with advice and Ibuprofen 600 mg -____- Of course. So I took the med right away and it was pretty effective, but I still had to deal with this insane discomfort in my throat for the rest of the day. I had soup once and that was it, all day. Next day, I went to work. Not important. It was horrible. I came home crying to my mom and told her I might have to go back to the hospital again. I told her I was afraid of dying. It hurt so bad, I had only one meal again. Soup and water with my meds. Checked my temperature again, 101.7. Time for bed. I’m finally home, eating normally. I can’t even begin to thank this doctor. Less stress. Eat less. Less work. Less stress. Eat less. Less work. This is what constantly runs though my mind before I head to work. I say a little prayer each day – for a hopefully peaceful day. I’m supposed to be asleep right now because I’ll be charge tomorrow again. I can’t sleep because my mind is not at rest. My body’s aching – tired – sore. My last resort would be to end up taking medication for my anxiety. This morning I came into work, expecting to do MDS so I came in late… I had a gut feeling the night before that someone would call off. It irked me for the longest time before heading off to bed. When I came in this morning, sure enough… I was told that I’d be charge. Eight hours off MDS – I’m behind again. I also had a no call – no show CNA. I’m starting to write more. I need to. People say that the facility I’m working at is such a “chill” place or “so easy”. What makes this place so easy is how many things people get away with. The bosses care up to a certain point. Red flag! One point I’ll get across is – never admit a loved one into a nursing home! I believe in what’s right. I try to be fair. I’m an advocate to these people. I want to do things the right way. I don’t understand how some people sleep on the job! This is why I’m not fit for a nursing home. Only after the third month of working at this facility, I was discouraged. I had very little to no excitement coming to work. I was doing swing shifts for a while. I started and only applied for the morning shift. Back in May, I worked night shifts. First day in June, I switched back to day shift with a promotion! My previous post contains all the details – minus the small distractions that kept me going for so long. Mind you, I’ve only been in this facility for 6 months, but I’m already absolutely drained! I have a fixed Tuesday – Saturday schedule now. When charge nurses call off, MDS takes over for that station. I remember when it was almost constant – the call offs. I was falling behind with my work and I would get chewed out for being behind. My coworker and I addressed the issue as to why we’re falling behind. No change. We would do double the amount of work, for the same pay as every charge nurse there. By this time, July was coming around and I was finishing up a 16 hour shift as a charge nurse… After having a minor breakdown on my day off, I decided to apply for Kaiser and LA County. I wanted to have something to look forward to. In August, I received a letter from LA County saying that my application was accepted and that I was scheduled to take a test. Long story short, I passed the test and received a phone call for my interview. She only asked me 5 questions, smiled, and took notes. Although I was nervous, I felt pretty confident about my answers. Those questions showed up on my NCLEX! So here I am, waiting… for my physical, which could take a whole month. I had my badge picture taken and fingerprints recently. Change is coming. They’re going to feel it. The feeling I had 2 years ago – the last time I wrote on here is quite the opposite of what I’m feeling today. Nursing… is not what I expected it to be… at least where I’m working at so far. There are the critical parts such as treatment and medications for the various medical conditions that these patients could have. Yes… I enjoy what I do! All of which I don’t mind – it can be done. As a charge nurse, your work is done for the day. As MDS, your work is NOT done for the day – ever actually. I honestly almost forgot that I had a blog until today. I can’t stress how much has changed. The amount of people I’ve lost contact with and the few that I’ve gotten close to recently. It’s the realest and most relaxed I’ve been.. happy even (after the twist and turn of events). This was the beginning of something different. I started school again for LVN to hopefully bridge to RN. We shall see… I want to finish what I started and not doubt myself anymore. At first, I was just visiting the school to inquire, but I ended up applying for the summer term. No more waiting around. So what did I do for those few months while waiting? I filled out an application for a passport and left the country with a good friend of mine, whom I’m confused about at the moment.. Some time around March, we went to Mexico – Tijuana, La Bufadora, and Ensenada. It was not what I expected at all. I never imagined going to Mexico, after all the things my parents warned me about; trying to get me to change my mind about going. But I was curious… it’s a beautiful place. In April, we made a spontaneous trip over to Vegas. I figured.. he should experience Vegas in his 20s at least once! I met a lot of his family members in May when we went to San Felipe in Mexico. That was the most fun I’ve had in such a long time. Unforgettable. June came too fast. Here I am in my second term and doing well so far. Two more terms to go then I get to take the NCLEX! Working at my same job full time and school full time is tough… At times I feel like caving, but I keep reminders for myself so I don’t cave again. A lot of people have come-and-gone these past few months. From coworkers to friends, they were great company, but we’ve all moved on for certain reasons. I haven’t withdrawn from old friends and it’s not that I’ve completely changed my lifestyle; I really haven’t. 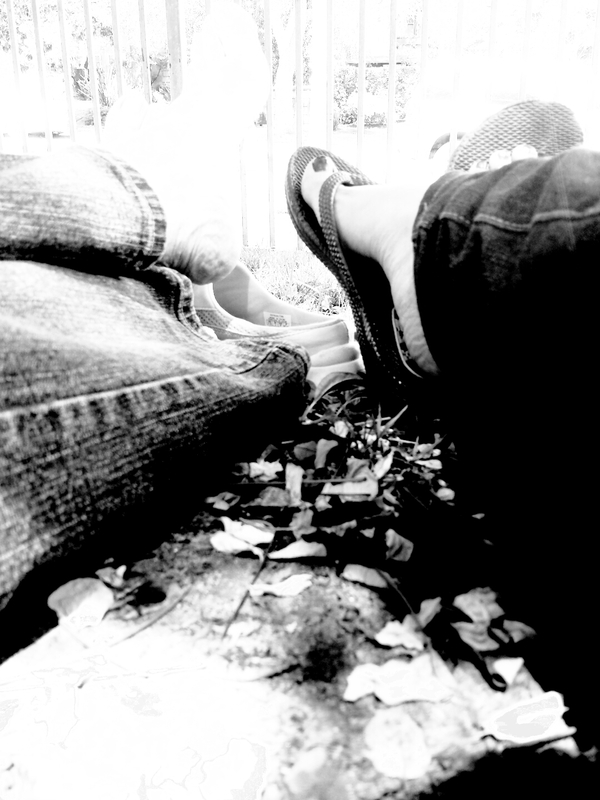 These days, I’ve just been craving for rest. I still love nightlife, venturing out to do anything and everything at night. I still love writing and I write a few things every once in a while, but privately, in journals. I still love learning languages. In January, I held off on my Korean for a bit to focus on work, but somewhere around April, I couldn’t take it (not learning) so I started off again; a lot better this time. Being outdoors, wandering, relaxing at the park, hiking, etc. Everything I’ve always loved is still there, but… there’s just not enough time in a day. Work consists of dealing with a lot of people M-F. I’d say roughly a little less than 100 people a day, that’s a lot. Who knew that could be tiring? New Chapter or just a Revamped Version? Gained an interest (or two). Totally unexpected, but that’s too personal to share. Learned a new language (still learning…) so I have to hold off on my Korean for a while so I don’t get confused. Started caring about fitness all over again (benefits of working in a healthcare environment. After working at this site, I realized that even though it’s not my main interest, I don’t mind the environment at all. The company that surrounds you is what usually influences you to make certain actions or change some ideas. It’s only been a month and I hit it off with a lot of my coworkers. I’ve never been surrounded by so many coworkers with awesome personalities before. The big change that I kept talking about before… maybe this is just the start of it. This is a year of great opportunities and change. It’s like I disappeared from the tech life altogether. I’ve been lurking, but haven’t posted much, which is a miracle for me. I’ve actually been sleeping more; the after effect of working again. I did some online shopping earlier this morning. No regrets because none of it is for me. I’ve given a lot of thought into what kind of tattoo I would get for such a long time. I’ve been collecting pictures off of various websites that I found appealing to me. I don’t want to get a tattoo simply because of how pretty it would look or a really great phrase that has absolutely no value to me. Of course, once it’s done, you can’t change it. It’s permanent. Total understatement of the century. It’s a commitment that you’ll have to hold onto forever unless you decide to remove it. It’s painful to get as it to remove, so I’ve heard. 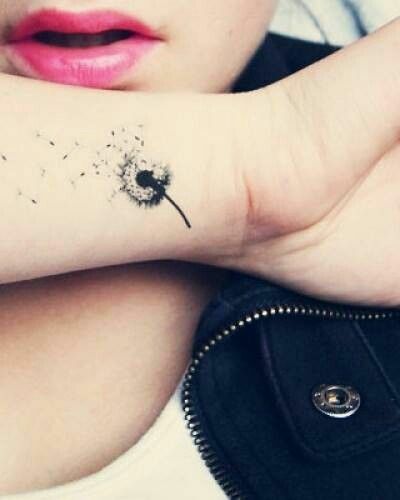 I thought of getting a dandelion, not on my wrist as shown in the picture. I’m not certain about the placement, but I also thought of having the words, ‘Joie de vivre’ along the side of it. There’s nothing complicated or fancy about it, but I assure you, it means a lot for me. Dandelions have many meanings to it. I used to come across these adorning the front yard of our old house. I was told to never touch it, but I was young so… I did. I didn’t see anything wrong with picking one, blowing the little weed in fascination when the little puff of white swept away in the breeze. I was told that if you make a wish, it would come true. I was a true believer of these petty things. I was 6 years old and very gullible. Simple things were fascinating; anything related to a dream or wish was. ‘Joie de vivre’ came along as I grew older, when I was recovering through tough times. The joy in life is to live your dream and let it lead you where it may. 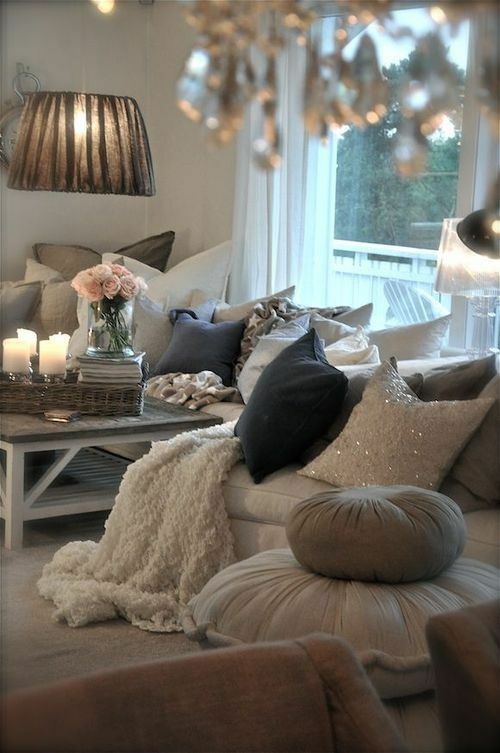 I love cozy; I’m in dire need of it. I can’t stress that enough especially because of the course of events I’ve experienced this year. Luxury doesn’t have to be expensive. I’m blessed to have everything I need to live. These ‘things’ that I say I want, can wait… I don’t need them. Not now. I was not born into a rich family. I never got to experience that kind of luxury. I actually consider comfort a luxury. Why? It’s 6AM in the morning, the time I wake up almost every single day. (I have a tendency to wake up before the sun rises) After shutting off my alarm, I usually wait for another 5 minutes before peeling the covers off to get up. Before I make my way down the top bunk, I sit up-top, overlooking the tiny bedroom I’ve lived in since elementary school. It’s been a very long time. I always start my day with a coffee and check my email before heading out to run my errands, go to class, or work. I’m busy all the time. I’m not sure if it’s just the amount of things I think about or the amount of things I do throughout day. Either way, I’m constantly engaged in something. My day comes to a close around sundown. By this time, I’m beat. If it’s not the noise of living in the city, it’s the running or fast-pace walking I’m used to. This year it was rare for me to leisurely walk through the malls or the beach. I’m always in a rush, moving from place-place. ‘I’m running out of time!’ It’s a reminder I warn myself, usually around lunch time. Why do I do this? I don’t know. A lot has changed since the beginning of this year. I’m hardly at ease. It totals up to 12 hours of being awake, whether I’m here at home or not. I don’t sleep right away when I get here. I either eat or become totally engrossed with my laptop to catch up on news or replenish my energy with upbeat music, as if I need it. I’m a night owl. I’m used to functioning well in these hours. I just can’t fall asleep no matter how tired I am. As of right now, it’s 1230AM of Sunday! I lost track of time again. I finally figured out why… it’s simple and clear. I’m not comfortable. I’ve never been. I’m awake during the day because I have to, but I’m always drowsy. At night, my energy picks up, but not as much. It’s the bed I come home to, to unwind and take a breather, from this lifestyle… It’s all worn out. I sink into some areas of it, embracing me uncomfortably. It’s a twin size bed up-top; I can only move so much… How did I get used to sleeping this way for 16 years? I have no choice due to some circumstances. When I get the chance, when I reach stability, I’ll save up enough to have my own space; my own little haven. It’s almost a rare opportunity for me to plop onto a comfy, cozy bed and drift off to sleep.